‘Are you paying attention?’ is the opening sentence of Morten Tyldum‘s, 2014 year movie, The Imitation Game. 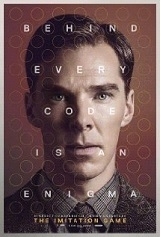 It is a dramatic story that intends to pay our attention to the spotlights of Alan Turing‘s (Benedict Cumberbatch) life as the British mathematician who cracked the Nazis’ Enigma code in World War II and who is the inspiration of Turing Machines, known as computers today. The opening sentence in the interrogation room is depicted as a result of a burglary investigation in Turing‘s house in 1952 although Turing insists that nothing has been stolen from home. Then, the story takes us to London of 1939 where it all starts. Turing has applied for a top secret position in Bletchley and is called for a job interview with Commander Denniston (Charles Dance). Commander is very much impressed with this 27-year old prodigy in Cambridge despite his vain-in-modest refusals that he could not be claimed as a prodigy. At the end of the interview, Turing is offered a top secret role as the Enigma codebreaker which is described as impossible and he accepts it. After some time, he has problems with his superior, Commander, regarding the funding of a devised machine to crack the code. And he talks to British Secret Intelligence Service Chef Stewart Menzies (Mark Strong), and decides to take the issue up with Winston Churchill. Churchill agrees funding his machine and appoints him as the team leader where Turing rebuilds the team by narrowing it down with Hugh Alexander (Matthew Goode), John Cairncross (Allen Leech), Peter Hilton (Matthew Beard), and Joan Clarke (Keira Knightley). Clarke as a new comer to the team is a math genius herself and a loyal support to Turing throughout her life. Thenceforth, movie combines the story of Turing himself with his homosexual orientation in UK in 1950s and all the challenges that he faced, and decoding of Enigma by a group of genius young people leaded by Turing. The Imitation Game is known as the highest-grossing independent film of 2014. The Norweggian director, Morten Tyldum, does an excellent job in the management of cast, crew and the story in order to make this movie overall a masterpiece of all the times. It is an extraordinary story telling and a memorable way of melting the script and a staggering human rights issue together in one pot. The script is adapted from the book of Andrew Hodges ‘Alan Turing: The Enigma‘ by Graham Moore. It is obviously designed in a structured and ordered manner that could be taught, by default, as a best practice in any of the cinema schools. When this faultless script has met its Director and stellar cast, the inevitable cinematic miracle is born. Regarding the performances, Benedict Cumberbatch is glorious in his role as Alan Turing. He reflects the arrogance and naiveness at the same time which sounds impossible to perform. He wears Turing not simply as a character, but also echoes his reactions and emotions via diversifying them per each occurence. Ultimately, all cast does an amazing job in this 114 minutes movie. One of the most remarkable supporting characters is created by Mark Strong with his poker face, cold manner and deeply convincing voice as in the role of MI6 Chef. He fixes his physical liability into the role so successfully that there is not even a bit of overacting despite the character’s tendency to that. Cinema fans could remember him recently from Before I Go to Sleep (2014) and Tinker Tailor Soldier Spy in 2011. Finally, this is an amazingly inspirational story to be heard. More than a story, it is the history where 49,000 homosexual men were convicted of gross indecency under British law between the years 1885 and 1967 where their punishment for being a homosexual ended with mostly a jail imprisonment or enforced chemical castration therapy. Benedict Cumberbatch, who is nominated for the Best Performance by an Actor in a Leading Role in Academy Awards 2015, has already put his name to an open letter urging the British government to give royal pardon to those men convicted of gross indecency. If life demands struggle, via the help of an expression in the movie, God does not win the war, humans win the war. As Turing asks, can we judge whether he is a machine or a humanbeing? … and history is the sharpest self-evident judgement in the world ever… noone can ever imagine it.